This weekend we are marking what would have been John Bonham's 67th birthday. 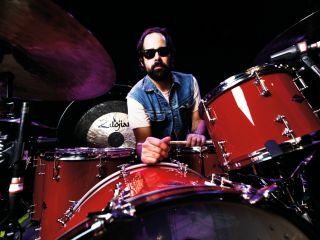 Drummers are lining up around the block to pay tribute to Bonzo, and it seems that The Killers' Ronnie Vannucci is quite the fan. The arena-packing sticksman even went as far to say that Bonham's music was a cornerstone of his childhood, adolescence and adult life. "They're [Led Zeppelin's albums] all my children. Because I wasn't alive when they came out, I look at all of the Led Zeppelin records as like paintings almost, works of art. Because I wasn't around during that time I appreciate them all for what they are - bodies of work. They're all special to me. I remember my mom playing IV while dropping me off at the library. She pulled up and she was telling me to listen to the drums, and I was like nine, I was going to spend a little day at the library. "But we didn't get out of the car for 20 minutes. We just listened to that whole side of the tape. It was probably the only time me and my mom had bonded musically. Led Zep IV reminds me of my mom telling me all about John Bonham. Led Zeppelin and Hendrix got me into drums. When I was a kid I was the first born so my parents were practicing on me. They didn't have money for babysitters so they would set up records and put headphones on me and leave me alone. Classic rock was my babysitter and Led Zep IV was one of those."